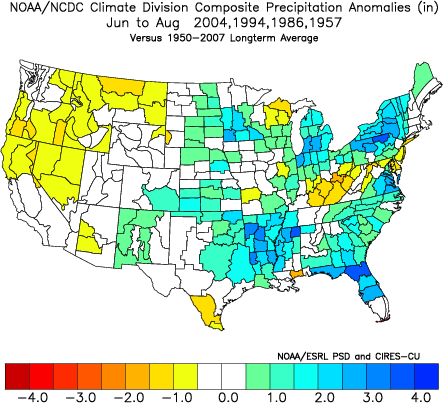 The big question as we head deeper into the warm season is if the persistent coolness that much of the country has experienced since last autumn will continue through the June-July-August (meteorological summer) period. The Mid-west and Great Lakes in particular have seen a brutal winter and spring, comparable to some of the coldest years on record. In fact, as proof of that incredible chill, ice flows were seen on parts of Lake Superior up through last week (late May)! The atmospheric regime that developed in the autumn of 2013 locked in place and continues to chug along like the energizer bunny. The key factor for this past winter’s forecast was the negative EPO signal (ridging over Alaska and western Canada) which led to the extreme chill over the Mid-west, warmth on the West Coast, and moderate cold in our area. That same temperature departure distribution may occur for the ensuing summer season, with the mean trough positioned in the Mid-west / Lakes. 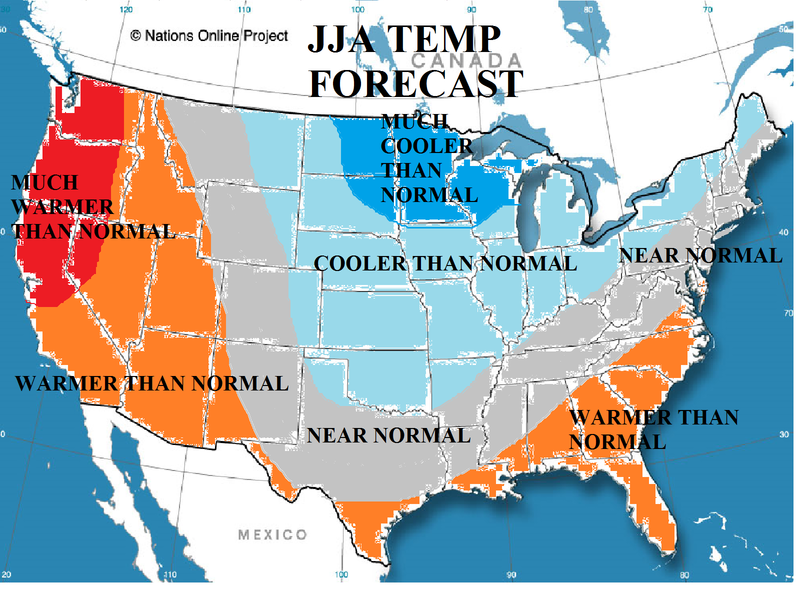 We saw this pattern through the winter, most of the spring, and now could potentially see it into the summer. Why should the negative EPO persist? Is there a chance it could reverse to a positive modality (trough over Alaska)? The probability is quite low. Very warm SST’s remain intact from the Alaskan coast southward along the Western US coast. The PDO flipped strongly positive over the past couple months and this is clearly much different than the pattern preceding the torrid summers of 2010, 2011, and 2012. Furthermore, the majority of oncoming El Nino summers with +PDO regimes also featured a negative EPO. Finally, the presence of the mid-level ridging in the NPAC through the end of May suggests that there’s a strong likelihood of it continuing into the summer. Other signals that will be present this summer are a developing El Nino, which could approach moderate status by August/September and even strong once into the autumn months. The NAO and AO should oscillate around neutral with probably more time spent on the negative side than the positive side. However, the NAO/AO are not as important in the summer months in terms of Northeast US sensible weather as they are in the winter. Although the NAO modalities were different in the four years, the general themes remained quite similar. The Western US and Southeast US were favored for warmth, the Mid-west/Great Lakes were favored for cool, and the Northeast corridor/Mid-Atlantic found itself battling both temperature regimes. 1986 and 2004 were slightly cooler than average for our area (NYC/NJ/LI) while 1957 and 1994 were near average to slightly warmer than normal. 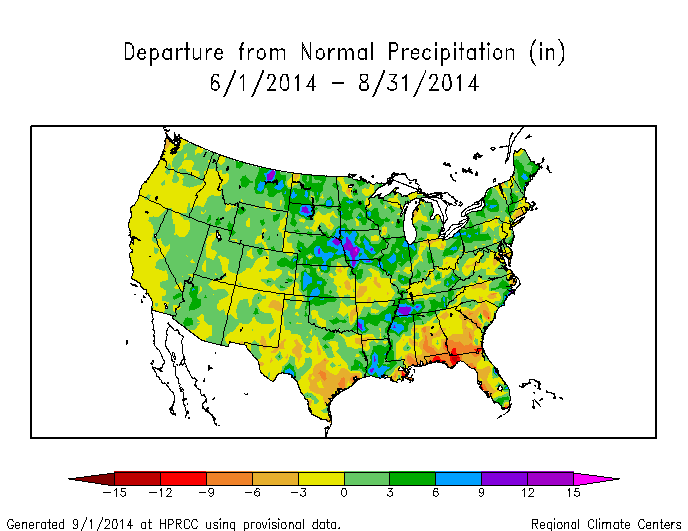 Precipitation wise, rainfall was plentiful from the Central US eastward in most of the developing el nino’s. When we couple the aforementioned factors with model data, (from the JMA, JAMSTEC, CFS V2 and ECMWF) it only bolsters the assertion of the warm West / cool Central / average East temperature pattern. 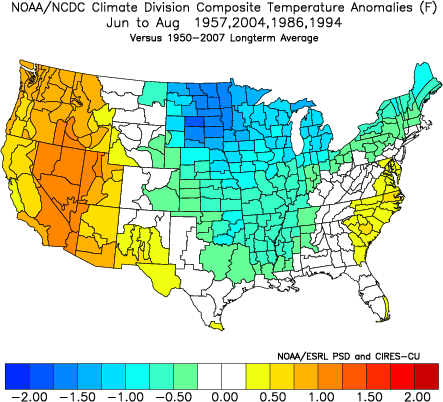 I am not doing monthlies, but the analogs suggest a cooler late summer and a warmer early-mid summer. Temperature Departures for the NYC area finished near normal. For a combined departure of -0.2 on the summer, June-July-August. This fell directly within the forecast range of -0.5 to +0.5 for temperatures. Precipitation was above normal in some locations and below normal in others, but overall in the local metro area, it was slightly drier than average. So the precipitation anomaly call was not as accurate. 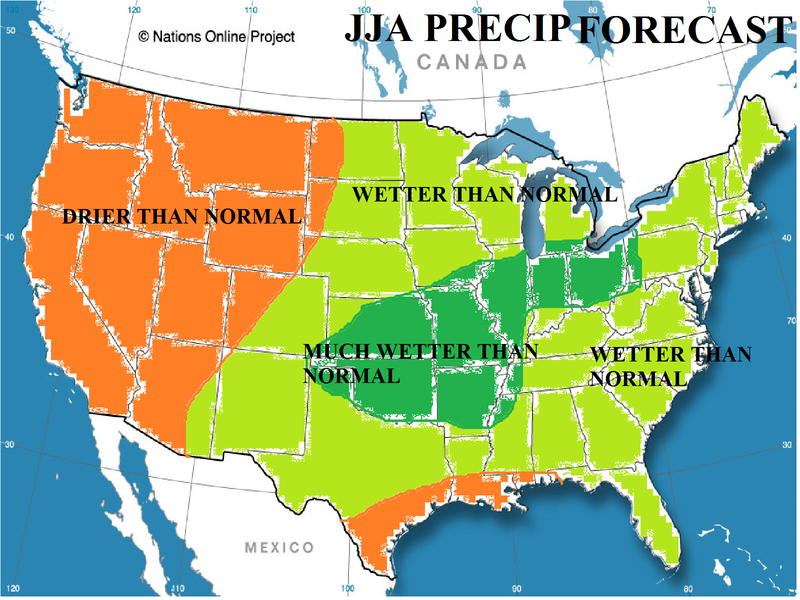 Precipitation anomalies suggest that the very wet summer occurred in the Central US as anticipated, with drying toward the West Coast. Above normal precip occurred for most of the Northeast. Overall, this summer in my opinion was accurately forecasted both locally and nationwide. The one flaw was the fact that precip was not as high as expected locally, but temperature departures were exactly as anticipated.